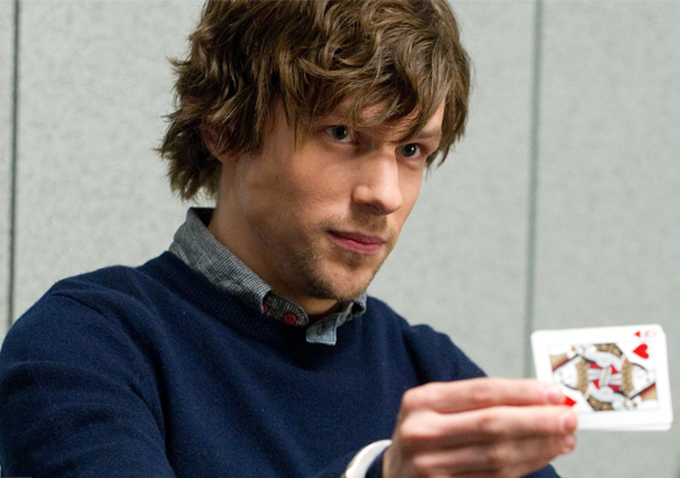 Starring: Jesse Eisenberg (The Social Network), Mark Ruffalo (Shutter Island), Woody Harrelson (Zombieland) and more. Director Louis Leterrier must have been “watching closely” and paying attention when he watched Christopher Nolan’s The Prestige. It has been a while since we’ve seen a magician movie (No…Magic Mike does not count as a magician movie!) and I loved the trailer from the first time I saw it: magic, heists, phenomenal cast! Wow! But, then, I paid a little closer attention to it and realized that the director also directed 2010’s Clash of the Titans (even though he DID also direct the first two Transporter films and The Incredible Hulk), and this made me reel in my anticipation just a tad. While Now You See Me is no Prestige, it does bring some pretty enjoyable entertainment to the card table of magician movies. 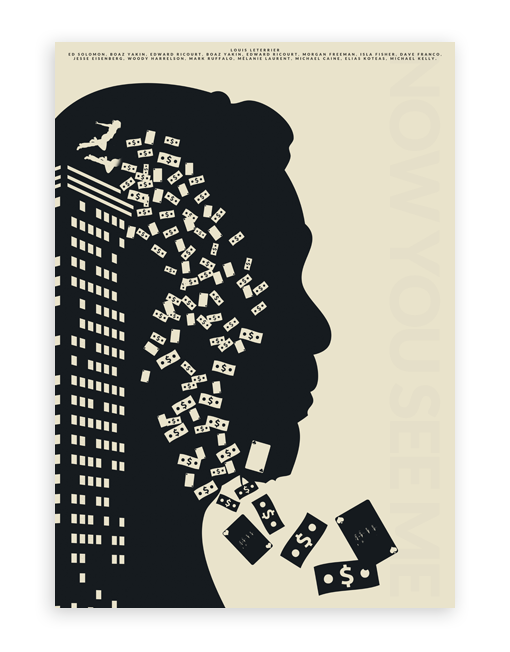 Hit the jump to read more of my thoughts on Now You See Me. It is always interesting that no matter how much magic movies repeat lines like this, people still end up with the “Ahhh” and “Oohh” moments! 🙂 And it is what we enjoy from such movies. When a film can pull the wool over your eyes or pull off a magic trick and truly surprise you, that’s when it becomes fun and interesting. Now You See Me starts off that way and keeps the momentum, for the most part, through its intrigue, mystery and witty characters. The cast make this film even more fun, although they all play parts pretty similar to other characters they’ve played before. Starring Michael Caine, Jesse Eisenberg, Morgan Freeman, Common, Dave Franco, Isla Fisher, Mark Ruffalo, Woody Harrelson and more, it is fun to see them all work together…seemingly in their element. While there’s not anything particularly wrong with that, I’d like to see a movie with Jesse Eisenberg and not think “Hey, that’s the guy in The Social Network…same charm, same almost everything!” They all do they parts well though, so no real complaint, but you’ll understand when you see it. The magic is what makes half of this film so much fun. The feats and proposed presentations of the once-upon-a-time street performers that have been catapulted to Vegas stage fame are mindblowingly fun to say the least. Letterier captured the essence of the captivating entertainment of magic and displays it very well onscreen. Each of the characters do their part, although some of them are a bit more annoying or…shall I say not as useful as you might think for the story as a whole (i.e. a rather inconsequential love interest and more). Look closely, because the closer you think you are, the less you’ll actually see. However, the two plots that coexist in this film work side by side and keep you guessing almost all the way throughout and it is one exhilarating show. With high speed chases, rabbits in hat tricks, floating money, bank robberies and a surprising prestige, Now You See Me won’t have you saying “I really saw that coming” and that’s what makes it fun. Lacking in a little bit of editing and storytelling, the films smoke and mirrors work to just let your brain enjoy the show…so, it is…in and of itself, a magic trick. Getting some mixed reviews, ultimately I enjoyed Now You See Me and found it not to be tedious but a bit tacky come the final reveal. A great cast sometimes causes you to expect an equally great film (Inception, Oceans Eleven, etc), ESPECIALLY when there are heists involved. While not GREAT, Now You See Me is a good entertaining and cinematic show. Check it out and be amazed alongside so many other magic lovers in theaters this weekend. Next Movie News Monday for June 3, 2013. You’re too generous. The actors all do their usual shtick, which makes them seem like poor actors since the director didn’t ask them to try anything else. None of the relationships between the characters fell natural or real, it all feels forced. So when these two romance plots have a kiss that’s supposed torn something it doesn’t. We don’t care about the characters or the relationships. Did I mention the script it bad? Yeah part of the problem with the romance story lines is they’re never set up. Magic in movies is never impressive to me. Because actual movie magic takes away from the effect and I’m less likely to believe what I’m seeing. The heists are ultimately meaningless and the big twist I see coming a mile away. The movie wants you to feel something when a character does or goes to jail or whatever but we just don’t care about anything. Especially the car chase that goes on way too long. Do you like movies with storylines you can follow and make sense? Do you like believable characters you care about? Do you like seeing great actors create those characters with the help of a great director! This is not the film for you of you said yea to any of those. Ultimately to me it felt like lazy film making. I hated Prometheus, but it was well made and just a failure. This was a failure because no one tried to make it good. And to me, that’s the ultimate sin when watching something, lazy film making. I’m shocked that anyone with their names attached to this project allowed it to be, especially after seein the final version. And one more thing, why does isla fisher wear driving gloves the whole movie of she never drives a f*@king car? Tell us how you really feel. 🙂 Ha. Thanks for sharing your thoughts. I understand but we will agree to disagree this time. I don’t think it made them bad actors just because they didn’t have a “challenge”. Yes, you could say all the actors were just playing a version of their own selves but it doesn’t really ruin it. I may be generous in this but it didn’t take itself all too seriously and I liked it. And your complaining about Isla’s gloves? Haha. So is this a younger persons Prestige? not so much, but yes…wait…no…um, perhaps? now, now now…that would be telling. Now You See Me is a ton of fun. The tricks are cool and the showmanship is great enough to do Lance Burton proud! Having been to multiple LV magic shows, it was nice getting that feeling of awe and wonder during the film. Even the simple tricks they pull are done in a very entertaining way. The actors all play their roles to near perfection. While it’s true that most of them play roles similar, if not dead-on, to some of their previous roles (Jessie E being most notable), at least the roles they mimic are of characters we actually liked in the first place. The diverse personalities and portrayals make for a very interesting and believable dynamic among the characters. It’s kinda like putting John McClain, John Rambo, Frank Martin, and T-101 in one movie but with a good story…. yep, tons of fun. There are few real gripes I have about the film. The random love story is unnecessary and kinda comes out of nowhere, the film seems to end three or four times after the climax, a few of the supporting character roles aren’t flushed out enough to make them at all relevant (what is Common’s role again… doesn’t matter), and the final reveal is a bit underwhelming… all of which, I can live with. The one thing that really bugged me was that while the prestige in the movie is great, I didn’t want to see the floating bodies in the containers so early and often. There is a lot going on in the movie with much misdirection. The film states the closer you look, the less you’ll see and that applies to the film itself as well as the tricks in it. Overall, I really liked it. 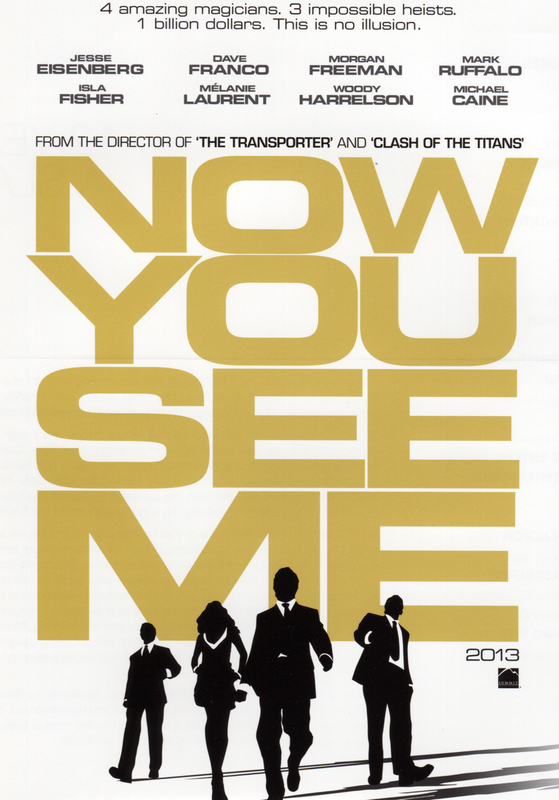 i will be interested in knowing what you think of Now You See Me when you watch it. and, THANK you for the nomination of the award. I’m going to check it out once it is released here….looks very entertaining. This has sounded like it would be fun, so I’m glad to see it at least gets middling marks out of you. I wasn’t expecting greatness, so I’m not disappointed on that front. How is Melanie Laurent? And how would you rank the cast? Laurent was perhaps the most believable for me, to an extent, only because I didn’t know her before this movie. Everyone else simply were playing extensions of themselves or characters we’ve seen them do before which made their acting a bit lazy.